It's Elections season in Singapore! We only get to do this once in about 5 years, so it is pretty big deal. This time there is much stronger opposition parties contesting all but one of the constituencies, which is a first for us. Everyone is discussing politics, the parties, the issues, our choices, etc. I'm not discussing politics here, this is a scrapbooking blog! :) But we decided it's time the boys get their education and first taste in our country's politics, government policies, and all that. 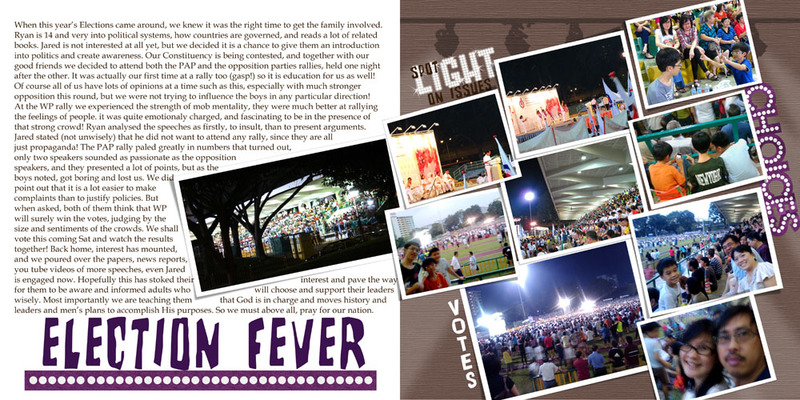 Here's a page (click to enlarge)I made to record this momentous few weeks of election fever, in our country and in our home! "When this year’s Elections came around, we knew it was the right time to get the family involved. R is 14 and very into political systems, how countries are governed, and reads a lot of related books. J is not interested at all yet, but we decided it is a chance to give them an introduction into politics and create awareness. Our Constituency is being contested, and together with our good friends we decided to attend both the PAP and the opposition parties rallies, held one night after the other. It was actually our first time at a rally too (gasp!) so it is education for us as well! Of course all of us have lots of opinions at a time such as this, especially with much stronger opposition this round, but we were not trying to influence the boys in any particular direction! At the WP rally we experienced the strength of mob mentality, they were much better at rallying the feelings of people. it was quite emotionaly charged, and fascinating to be in the presence of that strong crowd! R analysed in his opinion that the speeches start first, to insult,(lol) then to present arguments. Back home, interest has mounted, and we poured over the papers, news reports,you tube videos of more speeches, even J is engaged now. Hopefully this has stoked their interest and pave the way for them to be aware and informed adults who will choose and support their leaders wisely. Most importantly we are impressing on them that God is in charge and moves history and leaders and men’s plans to accomplish His purposes. So we must above all, pray for our nation." Amen! Been studying Isaiah in BSF and it is so appropriate to read about how through the rise and fall of all the nations, God oversees and intervenes for His own good purposes. We try to teach the boys how important it is to pray for our nation, our leaders, and whom should become our leaders. I am really loving this period of great discussions, analysing speeches, party manifestoes, government policies, etc with the boys. Ryan posted on facebook a suggestion dh had which impressed him, and we are observing the comments and likes and all. Unlike myself when I was young, it is so good to see them starting young, becoming aware and involved! 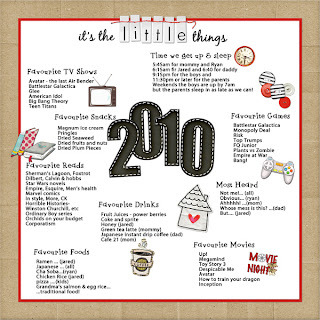 On the scrapbooking front I've completed our 2010 album, this is the last page I added, about the little things, I think I like my 'annual' albums even more than my travel albums, for they capture our lives, both the election type pages and the little things! 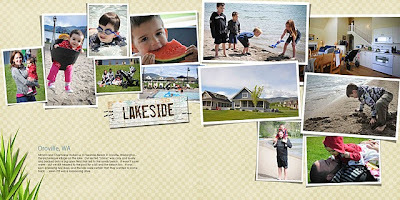 The book arrived from Shutterfly - lovely condition and quality as usual! Here are the front and back covers. 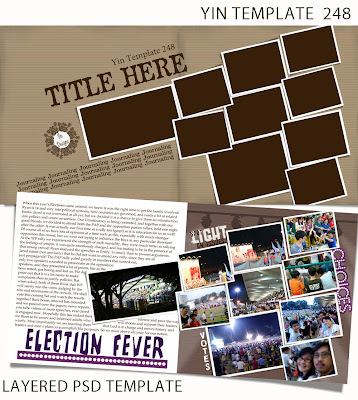 If you would like to have the templates of these covers according to Shutterfly 12x12 album dimensions, let me know! And I've finally started scrapping our Shanghai trip from last June! 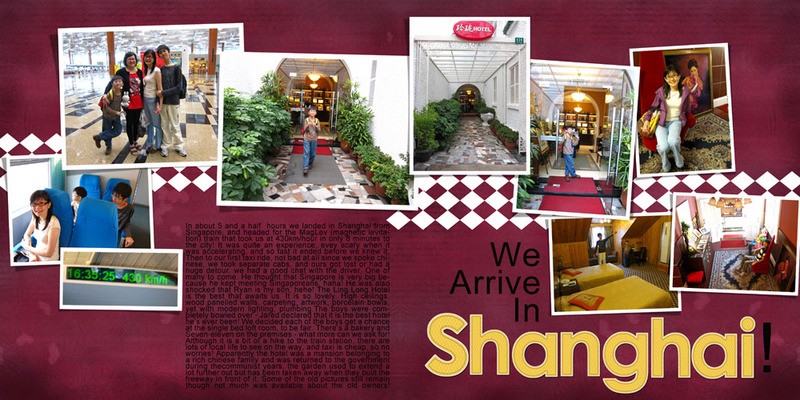 Here is the first page, arriving at our hotel (previously an old mansion) after a super high speed ride on the MagLev train! Oh, recently I've been hooked on Pinterest. It's a new website that allows us to 'pin' images we like from online to various persobal 'boards' for sharing and keeping! There are tonnes of amazing staff the folks there are pinning, and it's such fun browsing, Kate (whom I follow on Pinterest) had a post on it here at The Daily Digi. If you want to see the my pins, you can check them out here: http://pinterest.com/yin100/pins/. To join, you can request an invite on their page. Have fun! 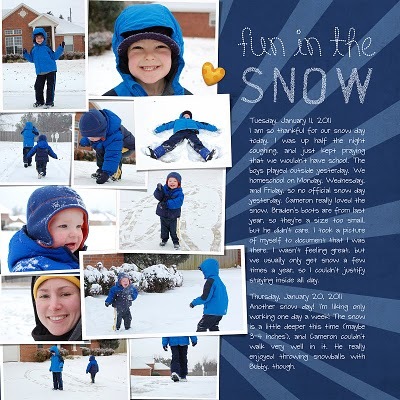 Stylish pages by Tawn (find her blog here) with her amazing photography and adorable children! Darling and colorful pages by Jenny (find her blog here) ! Thank you ladies for letting me share your pages! Love your work, everytime! This is so cool. Thanks so much! Thank you so much for another WONDERFUL template! Thanks so much! Your templates make a lovely addition to my albums. :) They make me happy. Thanks so much for the template and for sharing your life. Gorgeous! Thanks for being so generous too! I'm so impressed that your 2010 album is done! You and your hubby are doing a fabulous job as parents! I love how you seek out experiences for your sons to prepare them for adulthood. Thanks for the template! You Rock! Thank you, Yin! It is so neat to hear about the elections and how you're teaching the boys about it and letting them form their own opinions. I remember my parents always including me in their political discussions. That's something I probably need to be doing more with my oldest. I'm not even sure he knows who the president is (yikes!). I love that you are teaching them about God's sovereignty also. It is true, that even if the person we think is "wrong" for the job ends up winning it, God is in control, and will use all of our leaders to accomplish His will. They DO need our prayers! Thank you again for the great template. I've been going through my layouts, getting ready to order through Persnickety for their sale, and I was reminded again how many of your templates I've used! I posted just a few on my blog, if you'd like to take a look. Thank you once again for your generosity. I too loved the BSF study of Isaiah. We have an amazing God!! It so encourages me when i see young parents like you seeking to honor God in ALL you do. May He bless you beyond your imagination. Thanks for another wonderful template. If you could share the Cover and Back templates from your 2010 album that would be great. thanks for the template with tons of pictures. That is how I scrap our lives, and templates help a ton! I also love your end-of-the-year page, what a fun way to remember. Love reading your blog!! Thanks so much for the template! Thanks so much Yin. I don't know how I would scrapbook without your templates! They are my mainstay. Thank you so much! You're ideas are so inspiring! Thank you so much for your great templates. I LOVE your style and have copied it for my own. Thanks! Thank you so much! Interesting reading about the elections! Thank you so much. I love your style and find that my favorite pages that I scrapbook start with your templates. Thank you! Yin, thank you for your generosity and great templates. I think I love the ones you design the most (don't tell the others :-) ) Thank for the 2 pages also. Thank you for your templates! You are amazing, and I love ALL your beautiful pages! Thank you so much for your great templates. You do such gorgeous layouts. I'm such a fan of your work. Good templates as always. Thank you for the templates! I love your 2010 book. I would love the Shutterfly front and back and side temps...or do you just use the ones that you can download from Shutterfly? thanks for the template! right timing for me to scrap for a friend:). 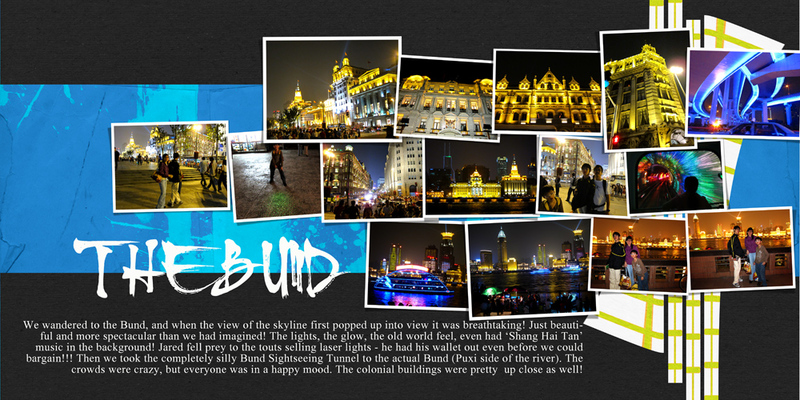 everyone (in the page) saw and loves it! may i ask, how many pages are there usually for a year book, like what you did? I just ADORE your templates. From the beginning they have been so amazing! THANK YOU SOOOOOOOOO MUCH!!! And I'm totally inspired by your scrapbooking and organization too. Wow. 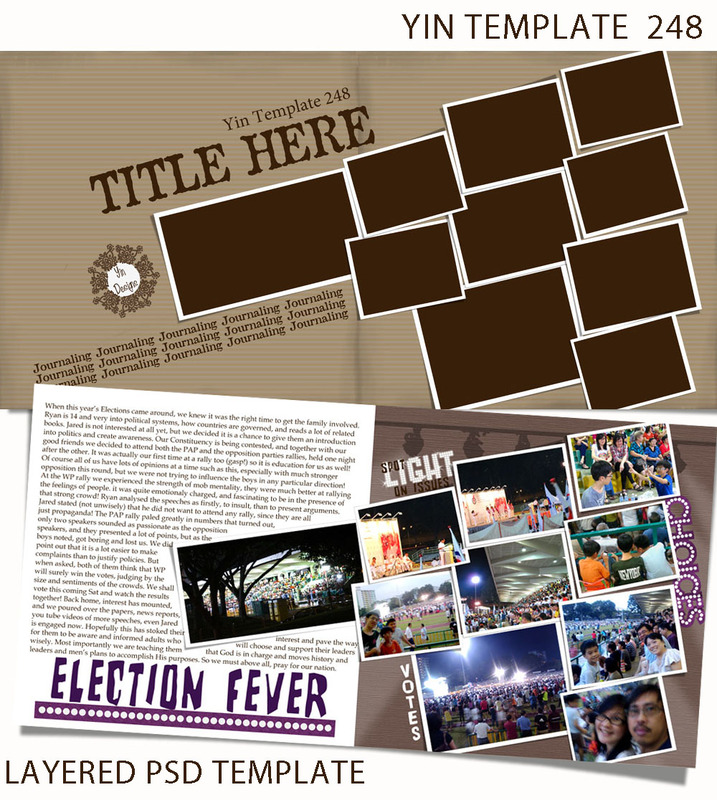 Here are a couple links to a couple of the pages I've done with your templates. Thanks!!! Thanks for sharing your templates! I love how you add so many pictures to your layouts! Their simple, yet clean/elegant at the same time.